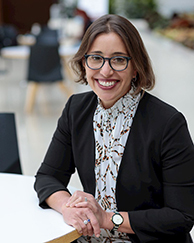 Caroline Grossman, ’03, is director of programs at the Rustandy Center for Social Sector Innovation at the University of Chicago Booth School of Business, the destination for people tackling complex social and environmental problems. She leads the center’s suite of programming and fosters opportunities for students and alumni to channel a business toolkit for social impact through nonprofit board service, social entrepreneurship, co-curricular experiential learning, and more. As an adjunct assistant professor of strategy, Grossman teaches Booth’s Global Social Impact Practicum, which is supported by Tata Trusts, one of India’s oldest and largest philanthropies. The lab course is designed to explore issues of sustainable development, philanthropic efforts, and the creation of a social enterprise ecosystem in emerging and developing markets with a focus on India. Grossman is a member of the University of Chicago Women’s Board and has previously served in other education-related nonprofit roles, including as a board member emeritus and past board president of the board of Barrel of Monkeys, an arts education theater company serving Chicago Public Schools. She has also served on the board of directors at the North Lawndale College Preparatory School. Grossman has coached civic leaders at the University of Chicago’s Civic Leadership Academy, served as adjunct faculty in the Department of Marketing at DePaul University, and has served on the faculty of the Chinese University of Hong Kong as a Yale-China Teaching Fellow. Prior to working at Booth, Grossman was a brand manager at Kraft Foods, where she led customer marketing for the $3 billion grocery business unit. Grossman has a BA in history from Yale University and an MBA from the University of Chicago Booth School of Business.